As a seasoned soccer player throughout high school, college, and co-ed recreational teams, my “gym bags” were always the standard Adidas soccer duffels. That was until I moved to NY and realized I had to tote my gym clothes and every piece of belonging I needed for the rest of the day in several bags. I immediately became the “Bag Lady” and quested to find the ultimate gym bag. Though Equinox (the luxe of all gyms) provide locker and laundry services for about $65 on top of your $150+ monthly membership, it becomes a bit exorbitant. (C’mon, that could be an outfit!) 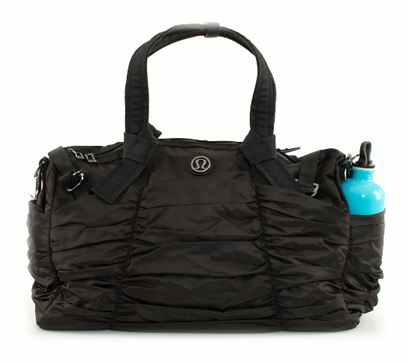 I came across thisLululemon bag at the Equinox store & snagged it up immediately! I LOVE lululemon. Their headbands actually stay place, even on a run. If I could afford for my whole workout wardrobe to be from there, I would so do it. Definitely! They’re the one athletic gear that stays put! I had a gift card to my gym’s store so I got some workout pants…LOVE!! Try checking into their website because I know they have ‘Sale’ items that you can snag for about 30-50%!